Loyalty360 interview with Michael Hinshaw. The ability to consistently deliver a great customer experience is something competitors can’t simply copy. Customer experience means many thing to different companies. At McorpCX, customer experience is its daily mantra. 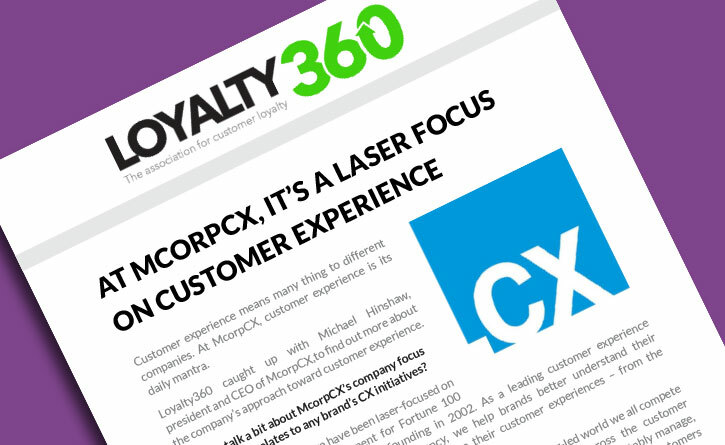 Loyalty360 caught up with Michael Hinshaw, president and CEO of McorpCX, to find out more about the company’s approach toward customer experience. Can you talk a bit about McorpCX’s company focus and how that relates to any brand’s CX initiatives? Hinshaw: At McorpCX, we have been laser-focused on customer experience improvement for Fortune 100 and mid-market leaders since our founding in 2002. As a leading customer experience management and transformation consultancy, we help brands better understand their customers – and better understand and improve their customer experiences – from the outside-in. The fact is for any brand to succeed in the digitally driven, customer-led world we all compete in today, they need to establish best-practice based capabilities across the customer experience value chain, and internalize the ability to systematically and predictably manage, develop, and deliver the differentiated, relevant, and personalized experiences that customers increasingly demand. In a very large nutshell, we’re well recognized as a global CX expert that helps brands do exactly that. And, of course, since CX is an investment, we also help them quantify, track and validate the value of their CX investments. CX is seen as such a key differentiator in the world of loyalty marketing. What is your view on this theme? Hinshaw: I couldn’t agree more. Because in today’s world of radically changing customer expectations, I believe there’s only one sustainable competitive advantage – and that’s to consistently deliver a better customer (employee, partner, etc.) experience - across all segments, journeys, channels, devices, and interactions. Realistically, today’s smart customers demand and expect more, and are less loyal than ever before. For example, nine out of 10 consumers say they will leave a brand after a single bad customer experience. For business customers – where leaving is typically harder – nearly seven out of 10 will walk. And, of course, all gladly share with friends and colleagues when things don’t go as they expected. The ability to consistently deliver a great customer experience is something competitors can’t simply copy. It makes brands more competitive and radically boosts customer loyalty. As a leading CX solutions firm, you say that needs tend to cluster in three areas. Can you talk about these areas? Hinshaw: Of course. And while our skill set is fairly wide, we find that, as you mentioned, clients’ needs tend to cluster in three main areas. Of course, there’s a great deal of crossover on these – we’ve helped many brands on all three at once, and others start with one area then move to another. First, we help brands create greater customer understanding. This basically means understanding from the customer’s perspective what it’s like to do business with them. It includes things like Voice-of-the-Customer research, persona development and journey maps, and data analytics. Second, we also get asked to help improve customer experiences. This ranges from end-to-end experience improvement to nailing the experience for a particular segment, process or channel. For example, we do a lot of digital customer experience improvement work. We also develop CX strategy, enable process improvement and do CX design. The third area is around helping brands build their customer experience capabilities. From assessing CX capabilities and building multi-year transformation roadmaps to customer experience training and education, we help brands define and prioritize transformation activities to improve CX maturity and focus. Do brands place a big enough emphasis on CX? Hinshaw: Leaders do and laggards don’t. I firmly believe that any company that isn’t listening to its customers and works to internalize CX, boost maturity, and deliver a better customer experience as a matter of course is in danger of extinction. Maybe not today, and maybe not tomorrow. But soon. There’s always the list of companies that get it, and those that don’t. Those who “get” CX will prosper. Those who don’t, won’t. This article on was originally published on Loyalty360.com.